The State Leadership Conference (SLC) is coming up soon, so it’s time to start getting ready! At the Region Leadership Conference (RLC), you will find out if you have advanced to SLC in your event. If you do not qualify for SLC, do not fear! Ask your adviser about straight to state events that start at SLC. One of the most exciting parts of any conference is the ribbons! You can receive special decorative ribbons to deck out your conference name badges for our annual Run for the Ribbons Campaign. Participate in many projects and see how many ribbons you can earn. 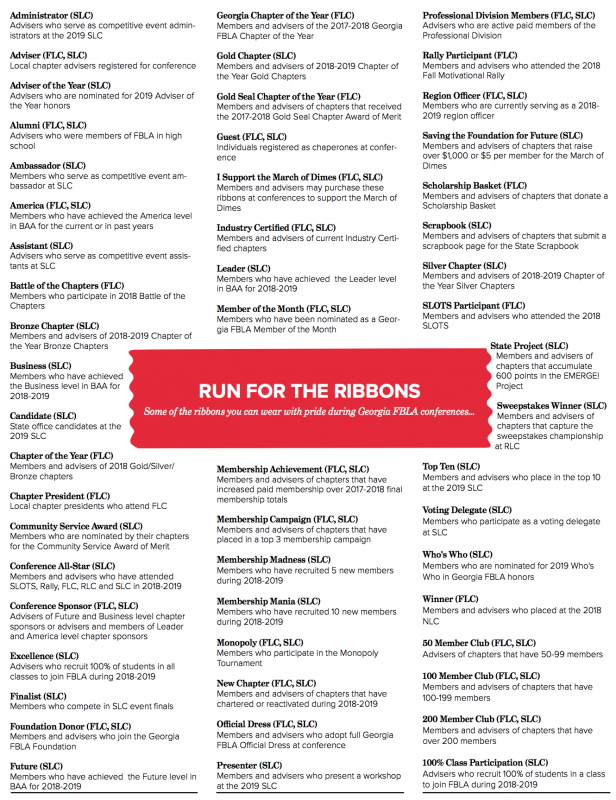 A full list of ribbons can be found in the Chapter Planning Guide. There will also be additional, fun ribbons for sale at the Marketplace.